THE Don’t Extradite the Basques Campaign was formally launched on Wednesday 10 June against the extradition to Spain of Belfast-based Basque pro-independence activists Iñaki de Juana and Arturo ‘Beñat’ Villanueva at a press conference in An Chultúrlann. Civil rights activist Fearghas Ó hÍr outlined the campaign on behalf of the committee, joined by a range of supporters including prominent human rights defenders and community activists, aiming to demonstrate the broad support for the human and civil rights of the Basque people from across the Belfast community. An online petition against the extraditions was also launched at the press conference. Initial signatories to this petition include Fearghas Ó hÍr, human rights lawyer Pádraigín Drinan, Eamon McCann (NUJ National Executive), Gerry McConville (Chair, West Belfast Partnership Board) and Michael Culbert (former Antrim and St Gall’s Football Manager). Speaking on behalf of the campaign, Fearghas Ó hÍr said: “The Spanish authorities are trying to extradite Iñaki de Juana, who served 21 years in Spanish jails, from Belfast, where he moved immediately after his release in August last year, to face questioning related to charges of ‘glorifying terrorism’. 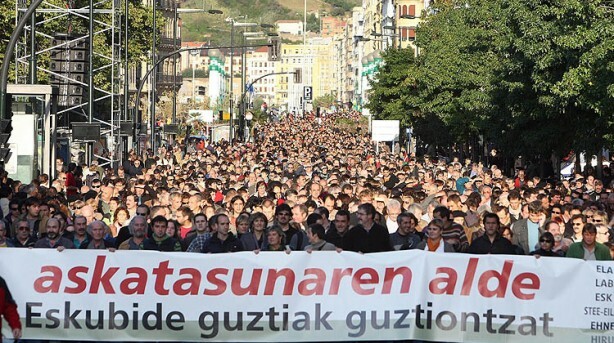 “The arrest warrant is based on somebody at a rally in Donostia in August, which was celebrating Iñaki’s release from prison, reading a letter that used the popular Basque expression ‘Aurrera bolie’ (‘Kick the ball forward’). The Spanish authorities claim this phrase constitutes a call for the continuation of armed struggle. “Iñaki was not present at this rally and denies writing such a letter, which Spanish police admit they cannot produce. There is no evidence that this comment was Iñaki’s or that it somehow constitutes a terrorist offence. “There has been a virulent and sustained hate campaign against Iñaki by the Spanish media for many years, and Spain’s former justice minister has previously publicly called for the judges to ‘construct new charges’ against Iñaki to ‘keep him in jail’,” Ó hÍr explained. Ó hÍr then outlined the case of Basque youth activist Arturo ‘Beñat’ Villanueva, who was arrested in March 2001 by the Spanish police, with 15 other young pro-independence activists, and was accused of being a member of Basque pro-independence socialist youth organisation Jarrai. “While Jarrai is a solely political organisation, it was declared illegal by the Spanish authorities in 2005 and categorised as a “terrorist” organisation by Spain’s Supreme Court in 2007,” Ó hÍr explained. “Charged with ‘membership of a terrorist organisation’, Beñat faced a possible 14-year jail sentence for his political activism. Released on bail after 10 months in prison, he did not attend what many believed to be a political show trial. “In 2004, Beñat decided to seek refuge in Belfast from Spanish political persecution and the risk of torture. “At the time of Beñat’s alleged membership of Jarrai (1994-2000), the organisation was legal. The Spanish court is applying the law that criminalised Jarrai retrospectively. “Beñat is being targeted by the Spanish authorities for carrying out political, public and peaceful youth work in the Basque Country. His only ‘crime’ has been his political ideas in favour of Basque independence and socialism,” Ó hÍr said. “In its effort to prevent the Basque people from exercising their democratic right to self-determination, Spain is breaching several fundamental rights as outlined in the UN Universal Declaration of Human Rights, including the right to freedom of opinion and expression, of peaceful assembly and association, the right to take part in the government of their state and the right not to be subjected to torture or abuse,” Ó hÍr said. “Iñaki de Juana and Arturo ‘Beñat’ Villanueva are clearly being persecuted solely for their political opinions, not for any criminal activity. We believe that there is a serious danger that they will not receive a fair hearing within the Spanish judicial system and face the risk of torture. The campaign petition demands that the Spanish government respects the fundamental human, civil and political rights of the Basque people as laid out in the UN Declaration of Human Rights and that it ends its campaign of criminalisation against the Basque pro-independence movement. The petition supports the human right of de Juana and Villanueva not to be persecuted by the Spanish government for their political opinions. 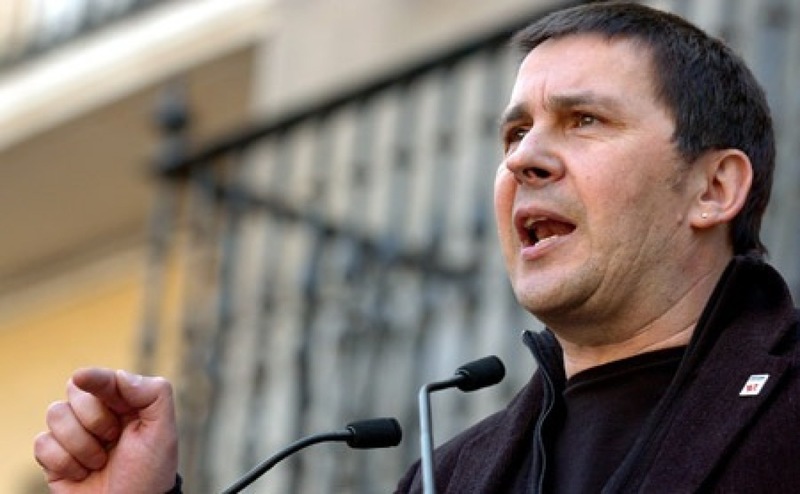 It calls on the British government to immediately reject the extradition requests and to refuse to collaborate with the Spanish government in this political persecution. Finally, the petition supports the right of de Juana and Villanueva to live freely in Ireland.